It was a cinematic, spring afternoon. The sky was unwaveringly blue, shot through with bleached-lemon sunlight, all framed by the piercing, green canopy of a long-slumbering Central Park. A cool breeze blew from the northwest, scattering pollen like snowflakes on a blanket of fresh grass. 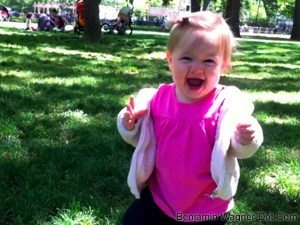 In the middle of it all, my eleven-month-old daughter walked, twirled, stumbled, collapsed, sat and giggled. She studied each blade of grass, each fallen leaf like it was her first. Abbi and I’d returned from our first, brief vacation without our precious cargo scarcely twenty-four hours prior. And while our four days and three nights in paradise (well, close: Turks & Caicos) were memorable and meaningful (we dove with dozens of reef sharks, blew through twice as many many Turk’s Head Lagers, resolved our Fifth Annual Los Ochos Locos Internacional competition in a draw and laughed at our numerous obscure, absurd inside jokes), we spent an inordinate amount of time talking about Maggie and — through the genius of iPhone — watching her numerous YouTube videos. I read just two books there: Haruki Murakami’s “What I Talk About When I Talk About Running” (no explanation necessary) and Dr. Margaret J. Meeker’s “Strong Fathers, Strong Daughters,” a ten-point, self-help book that elevated my already heightened sense of paternal responsibility (I said she wouldn’t date until she’s thirty less than twelve hours into her beautiful, little life) to uncomfortable levels through alarming statistics and first-person medical and psychological observation. Not that I needed a doctor to raise the stakes. No matter how many guys warned me how great fatherhood would be, no one prepared me for how massively transformative it is. So many things I thought were important — rock shows, movies, beers with pals, even running — have genuinely, authentically and comprehensively been replaced by the singular desire to spend time with Maggie. There is no sweeter sound than her laughter, and no greater sight than her smile. Ergo our trip to the park. And it happened so quickly. Standing there in the Tuesday afternoon, I marveled that — in just a few short months — I’d gone from taking cautious, infrequent and almost-instantaneous solo trips with Maggie to this: lunch in the park, neither harried nor hurried, patient and blissful than I could ever have imagined. Not that it was easy. I watched her every move, senses tingling like a lioness in the wild. I explained away danger (“That’s traffic, Maggie. It’s very dangerous and can hurt you very badly.” “That’s for looking and touching only, honey, not eating.”) “Let’s stay away from Harry and his friends, honey; they’re big boys.”) as if she understood. Maggie clung tight to my pinky — just enough reassurance for both of us — racing to and fro across the field, looking up at me periodically with big, wide eyes and a wider, two-tooth grin. Later, I spun her around and around above me head, shafts of sunlight backlighting her billowing, blonde hair. Her laughter rose above the cacophony of passing cabs and buses, helicopters, planes and pedestrians. Her fierce-blue eyes shimmered from behind her delicious cheeks and fixed on me absolutely confident in my grasp.